As @Junkers said someone should organise the 2016 RaGEZONE rewards this year.. here we go! 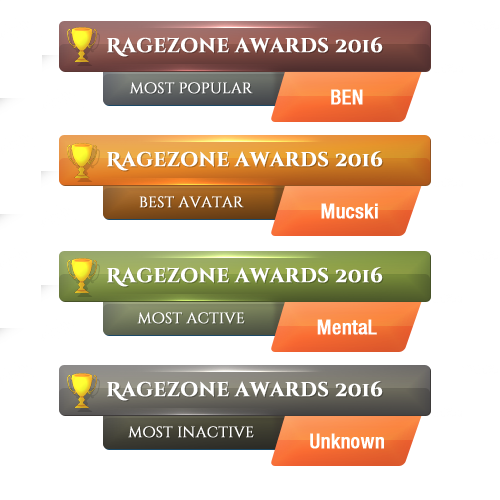 Another year passed and 2016 is coming to its end, time for the 2016 RaGEZONE rewards! There are NO design specifications. What we would like to see is something totally new. It doesn't even have to be a userbar! Just something that can fit into user's signatures. One slight rule, no NSFW material. Get creative with how you do that (GIFs are quite commonly used). The RaGEZONE community will vote for a winner in 3 weeks so entries are open until November 11th! There is also a Sub as a reward of your choice, except V.I.P courtesy of @MentaL! Last edited by Ben; 25-10-16 at 05:52 PM. so this is the official event this year? 'aight. Bit short time but I'll see what I can do. Wow, time goes fast. Can't wait to vote! There is also a Sub as a reward of your choice, except V.I.P courtesy of MentaL, so get working people! Also @Ben update your thread with the prize. Entries are open for 3 weeks instead of 2 just to inform everyone. i dont like old style of userbars , so i did something "new" ! Those user bars are so old school and big.. These look awesome, the old theme is a real kick in the back and will most likely take some people back to the time when the Userbar awards where first introduced! not sure if I will be able to submit something. @Ben Well I don't know if it will be effective, but maybe an extension until next friday and a promotion would be quite good. I talked with my fellow Moderators for some feedback, we will keep it open a bit longer as we currently only have 1 contestant. Date yet to be decided but start sending in your entries. Last edited by Ben; 11-11-16 at 01:34 AM.